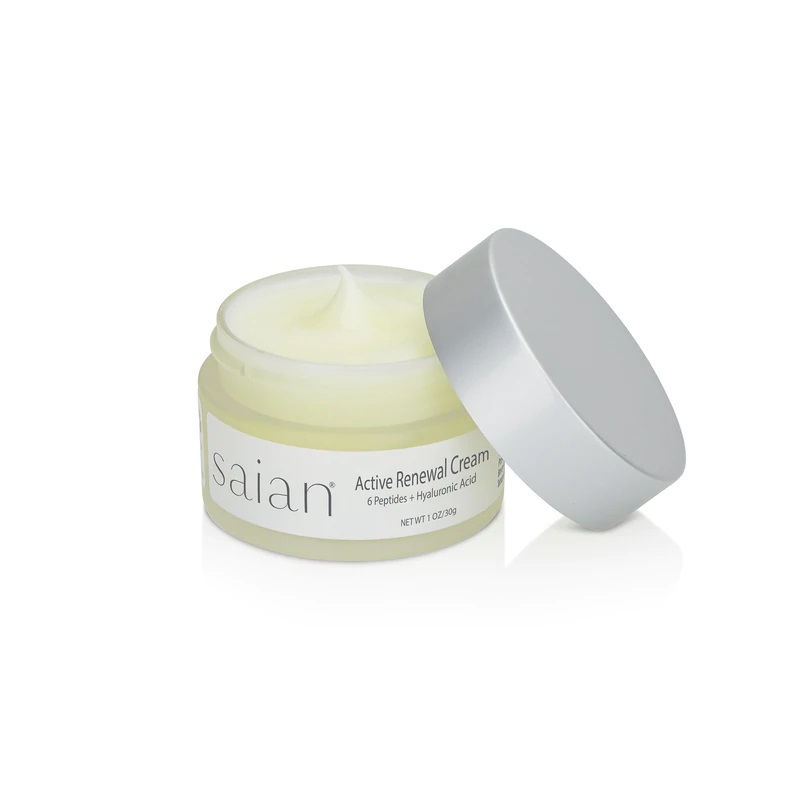 Saian Active Renewal Creme, improves wrinkles, crows feet and line prone skin. 1 oz. Active Renewal Crème contains Hyaluronic Acid and six of the most potent peptides currently available to address the affects of aging on the skin. 10% Acetyl Hexapeptide-8 (Argireline) improves wrinkle depth, wrinkle volume and roughness. Matrixyl-3000 minimizes crow’s feet and laugh lines, and prevents from further damage and wrinkle formation. Tests have shown wrinkles in the line prone areas will be reduced by up to 50% is used twice daily for a cycle of 28 days. Paraben-free, glycerin-free, propylene glycol-free, hypoallergenic and unscented anti-aging moisturizer based on Hyaluronic Acid and 6 active peptides. Apply to clean dry skin morning and evening. Best when combined with Saphir Active Renewal Serum. Finding Karen Herzog no longer worked as well for me at I got older I switched to Saian and skin 2 skin products which I find work very well for older skin. Coupled with the serum I find I am able to maintain firmness and hydration. My recommendation is to alternate between the two. This is the best facial care product I have ever used as it accomplishes all said claims. I have used it for a few years and haven't seen signs of aging yet! I have dark complexion w/very sensitive skin and my skin literally glows with this product. I receive compliments almost daily on my skin and all are shocked when I tell them my age (60 this yr)! I was disappointed in this product. I did not enjoy using it. I love this creme. It works well on my skin. I use it over the Renewal Serum. Together they have made a real difference on my skin. I look young for my age. Hyaluronic Acid: (plant source) In Europe, HA is used as a soft tissue filler, for lip augmentation, Acne scar revision, and treatment of lines and wrinkles. It is injected into the skin much like collagen with similar lasting results. The loss of skin elasticity that comes with aging, with the resulting lines and wrinkles, is often the result of decreasing HA levels. HA is the best topical hydrating agent and a potent anti-inflammatory. It stops itching and burning, is very soothing and, best of all, results in softer smoother skin. Can be used to hydrate the skin, prevent razor burn, and treat dry, itching irritated skin. Matrixyl3000: (Anti-Wrinkle peptide with Palmitoyl Oligopeptide & Palmitoyl Terapeptide-7) contains two matrikiness, Pal-GHK and PAl-GQPR which act in synergy to produce an nnti-wrinkle and lifting effect and 45% less deep wrinkles after 2 months.